The old adage may ring true for books, but it is quite the contrary when it comes to labeling candles for retail sale. There is a lot more to a candle’s label than meets the eye. Aside from burning quality, the label is the one chance that a candle maker has to communicate with the purchaser or the end user of the candle. Although it may not cost much, the label is a very important aspect, and actually has a lot going on within that tiny piece of real estate on your finished product. It is a place for branding your candle, announcing features and benefits, safety instructions, information pertaining to flavor and size, UPC codes, contact information about the candle maker, website, and anything else that helps sell candles. The first thing your customers* see is the shipping carton when they receive your candles (*customers are people who buy from you directly, while consumers are the end user who burns the candle). Although many candle makers do not put much effort into their shipping cartons, sometimes it is necessary to pay attention to them. Be sure they are not covered with wax that may accidentally end up in your customers’ store carpets. Make the cartons and their contents easy to identify when the cartons are in the stock rooms, so they can easily know how much of your product they have on hand. Be sure to include re-order information and pertinent web address information. 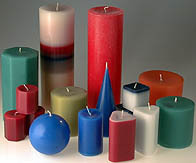 If you do nothing else, starting October 15th, 2003 there is a label that all candles using zinc cored wicks must have on the shipping cartons when being shipped to customer/retailers. If you are using zinc-cored wicks, you must put a label that states “Conforms to 16 CFR 1500.17(a)(13)” on the outside of the shipping container. This label does not have to be on each candle. If you are shipping an entire pallet of candles, the label only has to be on the pallet – not each carton. If you have further questions, please contact The Consumer Product Safety Commission (CPSC) at www.cpsc.gov or speak with the National Candle Association, and they can offer you more details. The label that is applied to the actual candle must satisfy a few basic requirements. It should fit neatly on the candle, will not cause risk of fire, does not turn black from the heat of the candles, and must contain all of the elements that satisfy the requirements set forth by your insurance company in regards to safety. Beyond that, it is up to the candle maker to use the label as a chance to communicate with the consumer. Always be truthful in the claims or ingredients you put on the label to promote good will and protect yourself from legal issues! It is a great idea to communicate product attributes that make your candle unique, such as extended burn times, quality or natural ingredients, and percentage of profits that go towards good causes. If you have a web site or toll-free number that consumers may use, be sure that gets on the label as well. Little things sometimes make a difference such as being made in the USA, contains no lead, or the use of essential oils will help boost consumer confidence when deciding which candle to burn. Always keep an eye out when you are in grocery stores or department stores to see how large manufacturers of non-candle related products label their products in hopes to discover a neat idea. Another way to help distinguish your flavors is to be creative with names by naming ordinary scents after appetizing or familiar aromas. Instead of using the scent “orange”, try “citrus explosion”, or instead of “baby powder” try “newborn miracle”. A good label will be concise and informative, yet not too busy. Balancing out the components while getting the message across is the key to having a successful label. Remember, you and your employees are representing your candle line, so why not label them too? When making deliveries, wear a shirt with your logo on it and put your logo/contact information on the delivery vehicle (magnets can be used on the side of personal vehicles). Always smile and be courteous when making the deliveries. Be sure to “label” your facility with a nice sign that shows pride. If you and your employees emit a sense of pride in your candles, potential consumers will pick up on the aura.